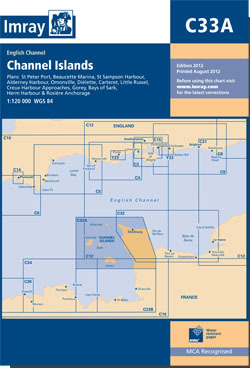 Shows the whole of the Channel Islands, and the associated coast of the Cherbourg peninsula to Cherbourg. Scale: 1 : 122,600. One-minute gridlines. Larger scale plans of St Peter Port, Beaucette marina, St Sampson Harbour, Alderney Harbour, Omonville, Goury, Dielette, Carteret, Portbail, Creux Harbour approaches, Gorey, and the Little Russel. 2016 EDITION - On this August 2016 edition the latest depth surveys have been applied. There has been general updating throughout. 2012 EDITION - Fully updated, plus the chart has been reschemed. New plans of Herm Harbour and Rosière Anchorage and Bays of Sark replace Goury and Portbail. The Diélette plan has been redrawn to show approaches at a more suitable scale, plus the Omonville plan has been repositioned for a better WGS 84 fit. Throughout the main chart and inset plans, positional accuracy has been checked and improved where necessary.